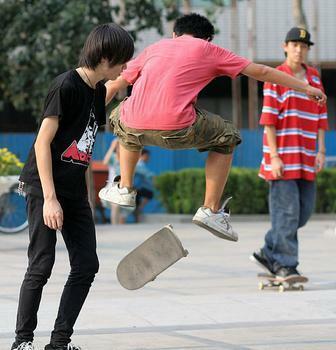 Why are so many adults angry at skateboarders? And what should you do to keep your skateboarding child safe? The other night, while the rest of my household was far off into Dreamland, I stayed up and watched a bunch of random YouTube videos. One group of videos I came across involved kids skateboarding, and the videos didn't show a bunch of cool tricks and stunts being done. They showed something else. Video after video, page after page, I came across a bunch of angry adults, either chasing young skateboarders away, yelling and cursing at them or taking their skateboards and refusing to give them back. Plus, there were a bunch of videos that showed adults actually getting physical with the kids. Either pushing them, knocking them down or taking actual swings at them. It seemed the adults' frustration stemmed from a combination of the kids skateboarding in a place they weren't supposed to, and talking back to the adults when they were angrily told to move on. (Adult language in the videos; viewer discretion advised). The whole thing was kind of bothersome, and although I'm not a skater and never have been, I related to their struggle of being part of a sub-culture that seemed to get a lot of adults and parents very angry. Hip-Hop culture and the skateboard culture seem to share a lot of similarities in that way. Punk rockers, surfers and a few other groups can be thrown into this category too. So if adults are trying to understand kids a little more and they want to communicate with them better, they should make some effort to ease up on the constant policing a little. At least that's what Linda Moore, the senior director of business administration for ESPN Productions Inc. says. In a report entitled "An Ethnographic Study of the Skateboarding Culture," Moore said by embracing skateboarders a little more, adults can build stronger relationships with the younger generation, and hopefully have their ear when it's time to pass on important life lessons. "Skateboarders are often seen as outsiders," writes Moore. "However, understanding the culture of skateboarding can be insightful for politicians, adults, or scholars who seek to develop stronger relationships with young people who participate in skateboarding." Watching the YouTube videos and hearing adults in my own neighborhood complain about teenage skateboarders, there seems to be a huge concern for the safety of kids, as well as the safety of the general public when skateboarders are around. 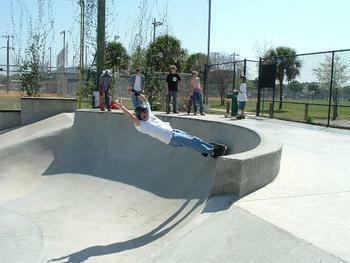 According to KidsHealth.org, more than 25,000 people have to go to the emergency room because of a skateboard-related injury; so many adults have it right when it comes to the sport being potentially dangerous. So if you have a child who wants to skateboard, or who shows even a slight interest in it, you want to make sure the right safety rules are being followed. Probably the most obvious piece of advice is to make sure your child wears a helmet when he or she is skating. You might get a couple of complaints from your child about not looking cool, but be sure to stick to your guns. It'll be completely worth it. And kids who are just starting to skate should wear elbow and kneepads experts say, because there will inevitably be a lot of falls before they're able to stay on the board and complete any kind of trick. 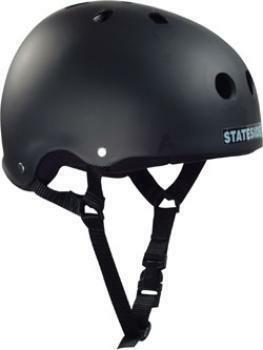 As far as helmets go, experts say to use one that's specifically designed for skateboarding and you should look for a sticker inside of the helmet that says it meets the ASTM F1492 skateboard helmet standard. In addition, KidsHealth.org says parents should buy sneakers made of leather or suede and make sure the sole of the sneakers have extreme grip to lower the chance of bad falls and tumbles occurring. And beginners should use other pieces of safety equipment too, like hip pads, wrist guards, skateboard gloves, padded jackets and mouth pieces. Moreover, experts say choosing the right size skateboard is of utter importance, so for a child around 13 years of age and about 5'3", he or she will need a full-size board that's 7.5 inches or wider. And the length of the board should be somewhere between 31.5 to 32 inches long. And for children younger than 5 years old and under 3'5" tall, experts suggest you choose a board that's 6.5 to 6.75 inches wide and 29 inches in length. But these sizes should be used as a reference guide and not as an exact measurement, experts say, because each child is different, so it depends on how comfortable he or she is on the board. And if you're an adult who doesn't have a child interested in skateboarding, try to be a little more tolerant of the kids you do see participating in the sport. Of course they should only be skating in skate parks and not causing a disturbance on private property or in heavily-used public areas, but rebelling is a part of what kids do, so don't expect all of them to skate exactly where you want them to. Yelling at skateboarders or taking their board away probably won't keep them from skating where they're not supposed to. And in many cases, calling the cops and having kids arrested isn't necessary, unless they're being really destructive in some sort of way. Or if they continually trespass on your private property. Trying to keep an open mind is key, says Moore, because a lot of kids are able to find themselves through skateboarding, which can spark their interest in other things that you might not think is so bad. "Skateboarding allows for individuality as rules are minimal and self-expression is encouraged," Moore writes. "This freedom to be creative and express oneself through skateboarding activity can be a means of empowerment. Through the cultural values of inclusion, having fun, self-expression, and progression, participants can build confidence to become leaders." "By understanding the culture of skateboarding, today's leaders are in a better position to understand tomorrow's leaders and develop communication styles to improve interaction between generations," writes Moore. Plus, it's important to remember there are worse things kids could be doing other than skateboarding, and with so many people complaining about kids playing video games and not getting outside enough, adults should really relax a bit. And when it comes to the whole rebellious anti-establishment thing, the more you get angry at skateboarders and complain, the more you fuel their rebellious intentions. Because one has to remember that many kids who belong to a subculture have no desire to get the approval of older generations. If that were the case, what would be the point of belonging to a subculture or even being young for that matter? I mean, weren't you like that as a kid?